Building nanomaterials with features spanning just billionths of a meter requires extraordinary precision. Scaling up that construction while increasing complexity presents a significant hurdle to the widespread use of such nano-engineered materials. Now, scientists at the U.S. Department of Energy's Brookhaven National Laboratory have developed a way to efficiently create scalable, multilayer, multi-patterned nanoscale structures with unprecedented complexity. The Brookhaven team exploited self-assembly, where materials spontaneous snap together to form the desired structure. But they introduced a significant leap in material intelligence, because each self-assembled layer now guides the configuration of additional layers. The results, published in the journal Nature Communications, offer a new paradigm for nanoscale self-assembly, potentially advancing nanotechnology used for medicine, energy generation, and other applications. "There's something amazing and rewarding about creating structures no one has ever seen before," said study coauthor Kevin Yager, a scientist at Brookhaven Lab's Center for Functional Nanomaterials (CFN). "We're calling this responsive layering-like building a tower, but where each brick is intelligent and contains instructions for subsequent bricks." The technique was pioneered entirely at the CFN, a DOE Office of Science User Facility. "The trick was chemically 'sealing' each layer to make it robust enough that the additional layers don't disrupt it," said lead author Atikur Rahman, a Brookhaven Lab postdoc during the study and now an assistant professor at the Indian Institute of Science Education and Research, Pune. "This granted us unprecedented control. We can now stack any sequence of self-organized layers to create increasingly intricate 3D structures." 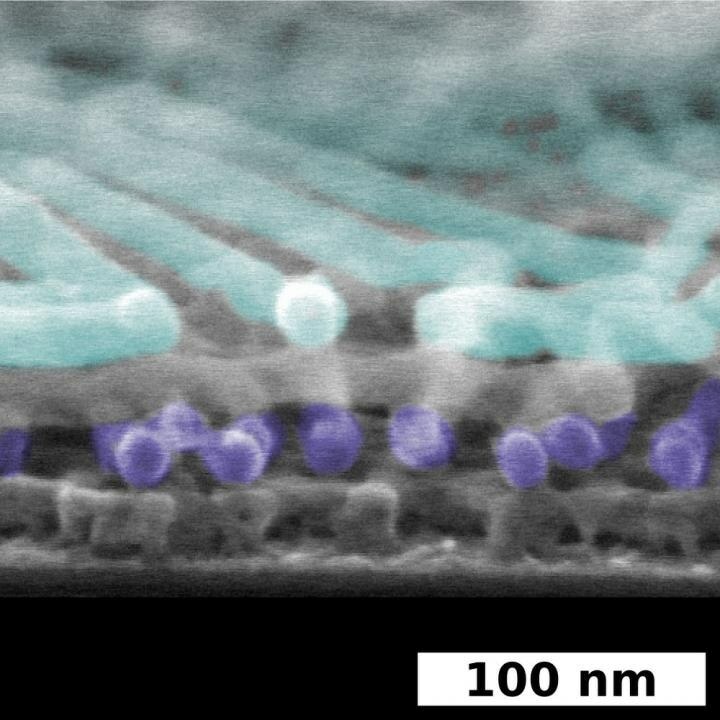 Other nano-fabrication methods-such as lithography-can create precise nano-structures, but the spontaneous ordering of self-assembly makes it faster and easier. Further, responsive layering pushes that efficiency in new directions, enabling, for example, structures with internal channels or pockets that would be exceedingly difficult to make by any other means. "Self-assembly is inexpensive and scalable because it's driven by intrinsic interactions," said study coauthor and CFN scientist Gregory Doerk. "We avoid the complex tools that are traditionally used to carve precise nano-structures." The CFN collaboration used thin films of block copolymers (BCP)-chains of two distinct molecules linked together. Through well-established techniques, the scientists spread BCP films across a substrate, applied heat, and watched the material self-assemble into a prescribed configuration. Imagine spreading LEGOs over a baking sheet, sticking it in the oven, and then seeing it emerge with each piece elegantly snapped together in perfect order. However, these materials are conventionally two-dimensional, and simply stacking them would yield a disordered mess. So the Brookhaven Lab scientists developed a way to have self-assembled layers discretely "talk" to one another. The team infused each layer with a vapor of inorganic molecules to seal the structure-a bit like applying nanoscale shellac to preserve a just-assembled puzzle. "We tuned the vapor infiltration step so that each layer's structure exhibits controlled surface contours," Rahman said. "Subsequent layers then feel and respond to this subtle topography." Coauthor Pawel Majewski added, "Essentially, we open up a 'conversation' between layers. The surface patterns drive a kind of topographic crosstalk, and each layer acts as a template for the next one." As often occurs in fundamental research, this crosstalk was an unexpected phenomenon. "We were amazed when we first saw templated ordering from one layer to the next, Rahman said. "We knew immediately that we had to exhaustively test all the possible combinations of film layers and explore the technique's potential." The collaboration demonstrated the formation of a broad range of nano-structures-including many configurations never before observed. Some contained hollow chambers, round pegs, rods, and winding shapes. "This was really a Herculean effort on the part of Atikur," Yager said. "The multi-layer samples covered a staggering range of combinations." The scientists used scanning electron microscopy (SEM) to probe the nanoscale features, getting cross-sectional details of the emergent structures. A focused electron beam bombarded the sample, bouncing off surface features before being detected to enable reconstruction of an image depicting the exact configuration. They complemented this with x-ray scattering at Brookhaven's National Synchrotron Light Source II-another DOE Office of Science User Facility. The penetrative scattering technique allowed the researchers to probe the internal structure. "CFN brings together a unique concentration of skills, interests, and technology," said CFN Director and coauthor Charles Black. "In one facility, we have people interested in creating, converting, and measuring structures-that's how we can have these kinds of unanticipated and highly collaborative breakthroughs." This fundamental breakthrough substantially broadens the diversity and complexity of structures that can be made with self-assembly, and correspondingly broadens the range of potential applications. For example, intricate three-dimensional nanostructures could yield transformative improvements in nano-porous membranes for water purification, bio-sensing, or catalysis.